Two Bucks County residents are facing theft and related charges for stealing 17 bronze plaques from graves in a Bensalem cemetery and selling them for scrap. 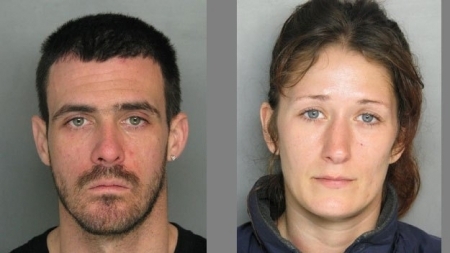 Andrew Townsend and Danielle Holmberg were caught on video removing the markers at King David Cemetery. They then sold them for scrap metal for pennies on the dollar. They were worth around $7500. Townsend's grandfather is the manager of the graveyard. He reported to police that his grandson had taken a minivan from the property without permission and bought tools on a business account presumably to use to remove the plaques. A broken sewer main near Valley Forge Park late this morning has caused millions of gallons of sewage to rush into nearby Valley Creek. It happened at around 11 am near the intersection of Route 252 and Route 23. The Valley Creek Trunk sewer ruptured and pushed through the roadway and began spilling into the creek. Authorities estimate that around 5 million gallons had already gushed out. The creek eventually leads to the Schuylkill River. Environmental officials say that the health hazard is limited to wildlife. The area will be closed for the next two days as construction crews work to fix the damage. Officials for the Centers for Disease Control and Prevention have confirmed that the Drexel student, Stephanie Ross, who died of meningitis last week had the same strain of bacteria that caused an outbreak at Princeton University last fall. The CDC says that genetic fingerprinting suggests the strain may still be active at Princeton. Ross was in contact with Princeton students about a week before she got sick. Drexel says that anyone who had contact with Ross has received antibiotics and no one else has gotten sick.